The crisis in Europe is not over, it's getting worse. 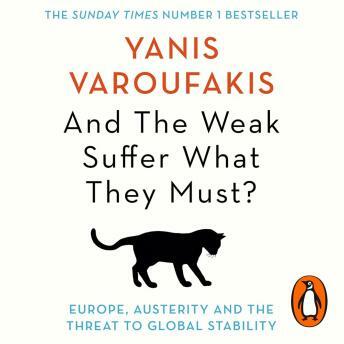 In this dramatic narrative of Europe's economic rise and spectacular fall, Yanis Varoufakis, former finance minister of Greece, 'the emerging rock star of Europe's anti-austerity uprising' (Telegraph), shows that the origins of the collapse go far deeper than our leaders are prepared to admit - and that we have done nothing so far to fix them. From the aftermath of the Second World War to the present, Varoufakis recounts how the eurozone emerged not as route to shared prosperity but as a pyramid scheme of debt with countries such as Greece, Ireland, Portugal and Spain at its bottom. Its woeful design ensured that collapse would be inevitable and catastrophic. But since the hurricane landed Europe's leaders have chosen a cocktail of more debt and harsh austerity rather than reform, ensuring that the weakest citizens of the weakest nations pay the price for the bankers' mistakes, while doing nothing to prevent the next collapse. Instead, the principle of the greatest austerity for those suffering the greatest recessions has led to a resurgence of racist extremism. Once more, Europe is a potent threat to global stability. Drawing on the personal experience of his own negotiations with the eurozone's financiers and offering concrete policies and alternatives, Varoufakis shows how we concocted this mess and how we can get out of it. And The Weak Suffer What They Must? reminds us of our history in order to save European capitalism from itself.